In the aftermath of Captain America: Civil War, Scott Lang grapples with the consequences of his choices as both a Super Hero and as a father. As he struggles to balance his home incarceration, he is 'liberated' by Hope van Dyne and Dr. Hank Pym with an urgent new mission. Scott must fight alongside The Wasp as the team works together to free Hope's mother from the Quantum Realm, while federal agents, gangsters and the mysterious Ghost all hunt them down. 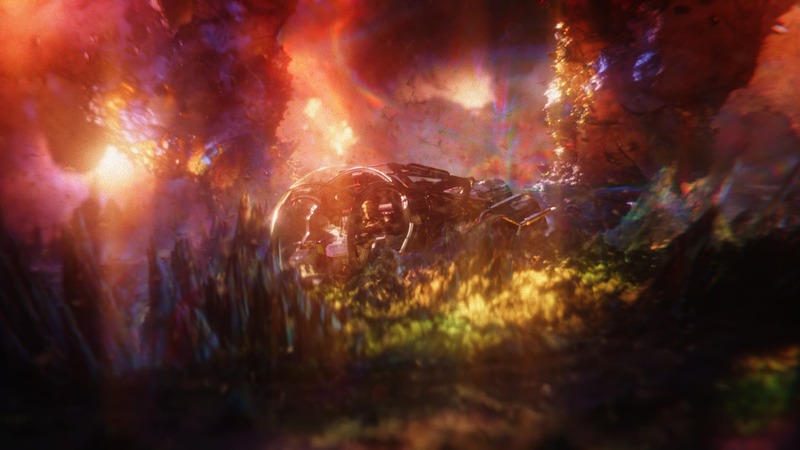 DNEG worked on over 500 shots including the third act chase sequence and the final Ghost fight as Hank and Janet are coming back from the Quantum Realm. Lola once again delivered some incredible de-aging scenes, while Method handled the 3D Quantum Realm and Luma did the rocket launch and the Ghost break-in. 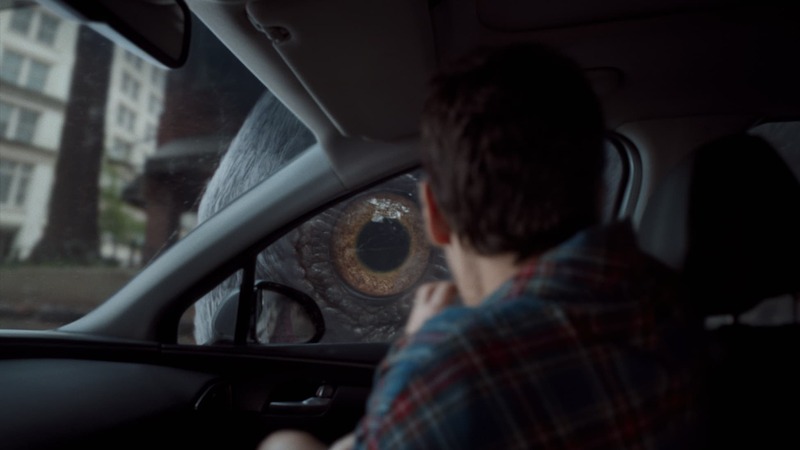 Several other companies such as ILM, ScanlineVFX and others also contributed. 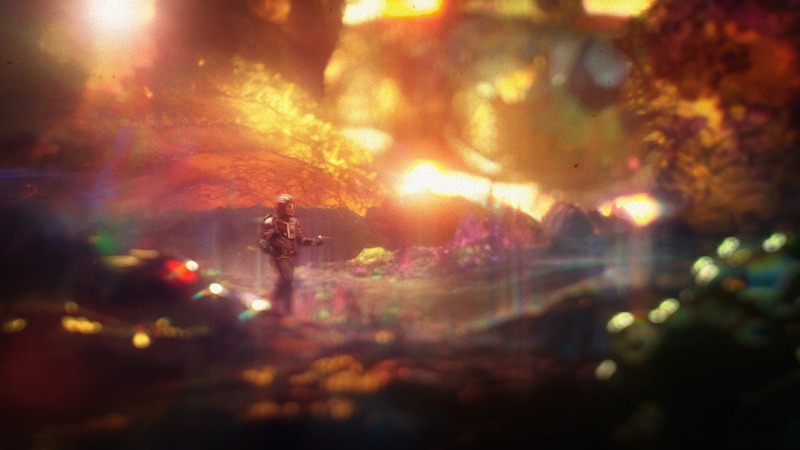 We spoke to DNEG VFX Supervisor, Alessandro Ongaro about the making of such tiny visuals. DNEG worked on the first film, especially on the 'marco-photography' sequences, but for Ongaro this was his first Ant-Man film. DNEG did not take exactly the same approach with the new Ant-man and the Wasp, but it did face some similar problems with getting a camera to seem small enough to capture the tiny action. For example, some of the photograph in this film was shot with a Frazier lens which is a special 'marco/split' camera lens designed by Australian photographer Jim Frazier that provides extra depth of field. Even with these special optics, DNEG could not get low enough to the ground for some of the 'small' scale shots and ended up having to re-project the road higher and 'raise the floor level' to simulate a tiny sized camera. Some of the visual effects were traditional greenscreen compositing, but most were complex 3D and extremely difficult 2D Nuke compositing, especially on the Ghost character. 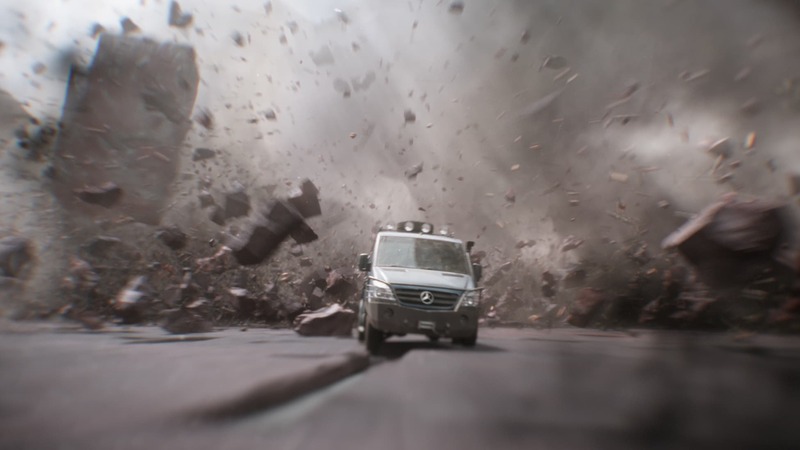 DNEG team rendered this film almost exclusively in Isotropix's Clarisse and composited in the Foundry's Nuke. (Check back with fxguide later this week for news from Isotropix). DNEG uses Clarisse with its own integrator and materials. They also use their own internal de-noise plus other custom software such as MagicMatte (which is similar to Cryptomatte ). There were also some Mantra rendered shots for some of the effects elements. 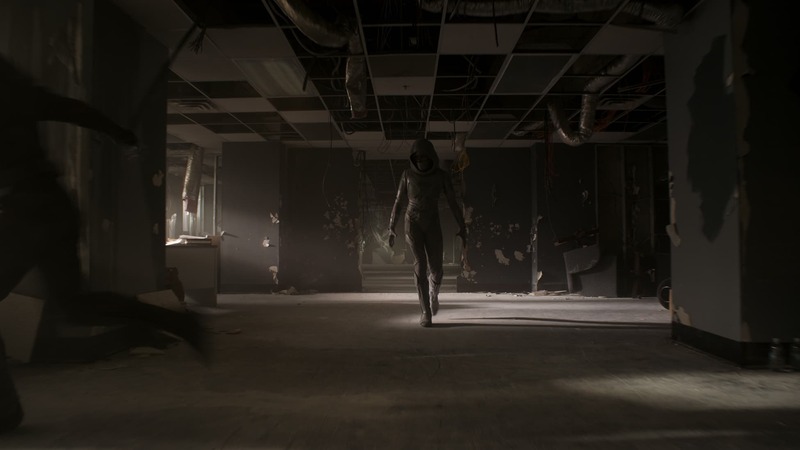 All the Ant-Man & the Wasp DNEG pipeline was based on deep compositing. Hannah John-Kamen played Ghost, (or 'Ambient Occlusion Woman' as the team jokingly noted). DNEG was responsible for building the Digi-double and the 'ghost effect'. Once that was done, DNEG shared the assets with other vfx vendors. They provided the blueprint for Ghost, not only the CG passes but a Nuke script showing how the elements came together. Ghost was the most complex asset that DNEG shared due to her phasing effect. Luma and others did some Ghost shots, but DNEG had the highest shot count of Ghost. The look of Ghost connects with the Ghost character from the Graphic Novels/comic books. The Ghost costume was scanned by Clear Angle Studios in London for use in 3D. They facilitated all her 3D scanning and processing. 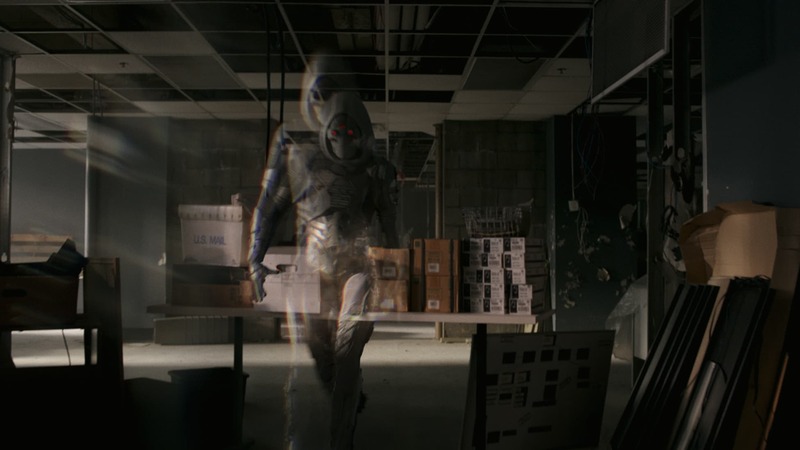 In addition to the fully suited Ghost, there was a hoodless version with a digital face and head of Hannah John-Kamen. "We were working to a high level of detail, especially for the final battle, which meant full hair and very detailed scanning", commented Ongaro. Ghost's phasing was developed at DNEG and influenced by some tests that had been done previously. "From the work that had been done, we knew what not to do, as the director had not liked it, but this also limited our options', explained Ongaro. The final look is designed around a 3D solution, comped in Nuke. "It was not possible to do it just as a 2D effect,... it needed different angles, or different paths, based on the idea of different realities, .. we called the effect the Phantom Images, these would indicate phantom or alternative paths she could have taken" he added. Interestingly, In the comics the Ghost has never fought Ant-Man. 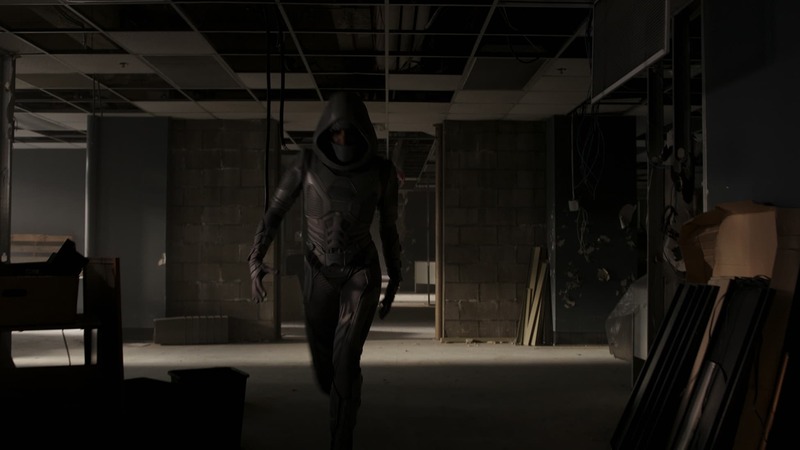 One of the complex aspects that the script and quick cutting action of director Peyton Reed gave the team was the fight sequences with Ghost. 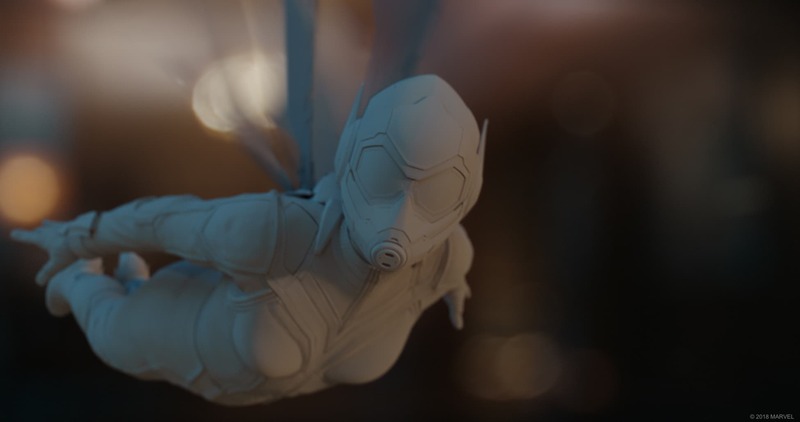 In any one sequence, Ant-Man, Wasp or Ghost would need to be in the shot and then suddenly small, flying or transparent. It was a highly complex task for both the visual effects editors and the effects artist to manage this. The film was shot on the Arri Alexa 65 and delivered in two formats, 1.90 : 1 (IMAX version) and 2.39 : 1. This meant "we worked full frame for most of the shots", Ongaro commented. The team cropped in on the original frame to get the more square IMAX ratio, and this squarer frame was used as the basis for the visual effects, (with just a bit of extra room to help the stereo conversion team). For the 2.39:1 version, the finished IMAX version was letter-boxed or masked top and bottom. Interestingly, most of the stereo conversion here was done by DNEG own stereo conversion team. "Which is great for us, as it saves a lot of time for our comp team, as they can just directly access to our server, which makes the whole data process much easier" explained Ongaro. 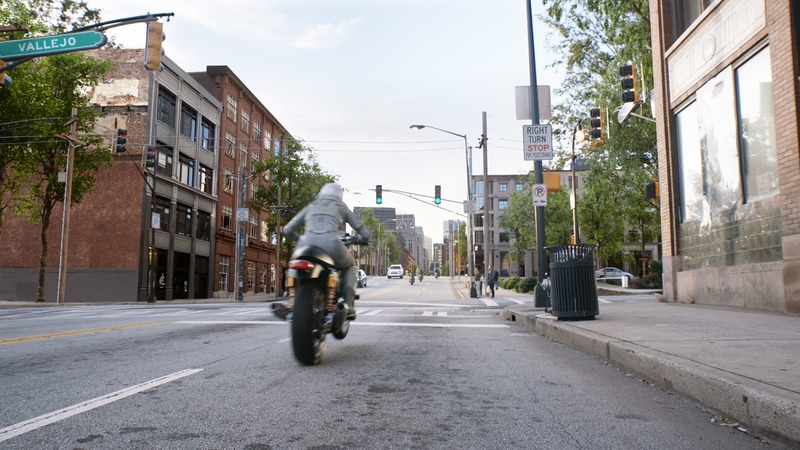 While the big chase sequence was set in San Francisco, it was primarily shot in Atlanta, this meant a lot of environment work, as well as the more obvious radical scale changes and action driving stunts. "it was a pretty challenging sequence" commented Ongaro. 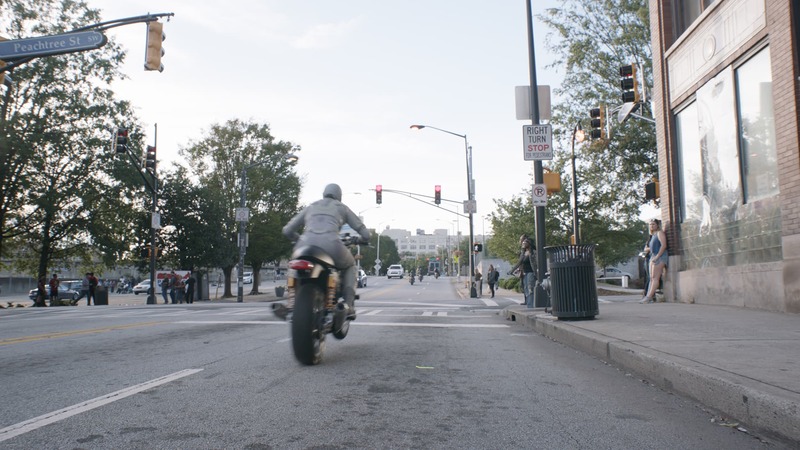 Atlanta is no where near as hilly as San Francisco, and "that the biggest challenge, it required extensive environment work, and in some shots we could really not salvage anything from the background of those Atlanta plates". 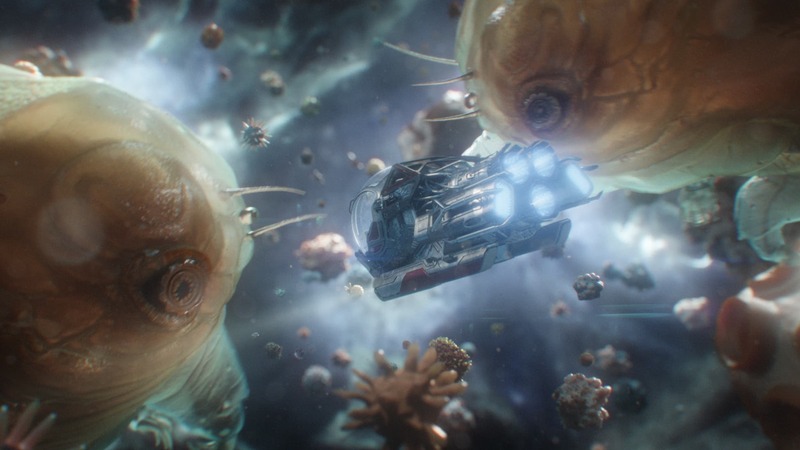 The Chase environments were supervised by Pedro Fernandes Santos "- who is an amazing CG Environments Supervisor. I think our environment team had to build a 100 city sets, given that it was a car chase, and so we needed so many unique environments. We would not stay on any one environment for more than 3 or 4 shots" explained Ongaro. 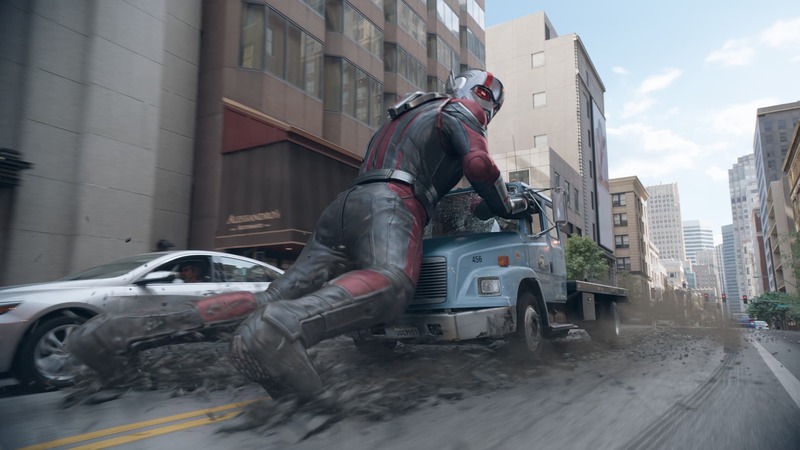 The flat bed truck Ant-Man rides on was primarily a real truck for about 80% of the shots. 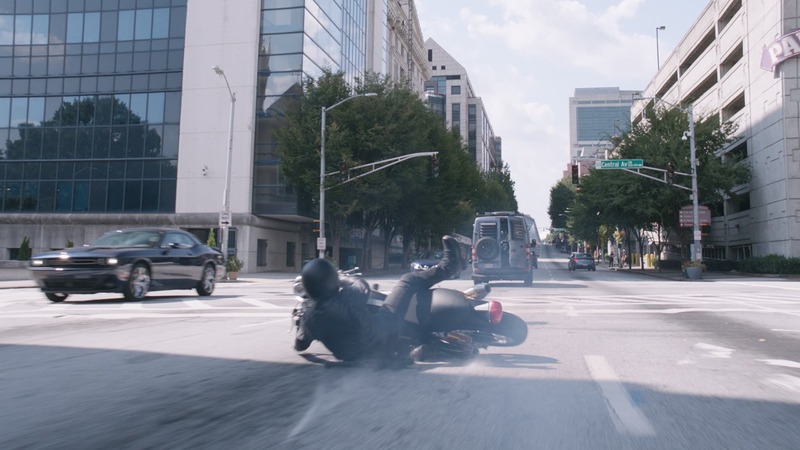 In addition to road debris, and Ant-Man himself, the truck had various elements such as a broken windshield, shadows and reflections tracked onto the live action element. 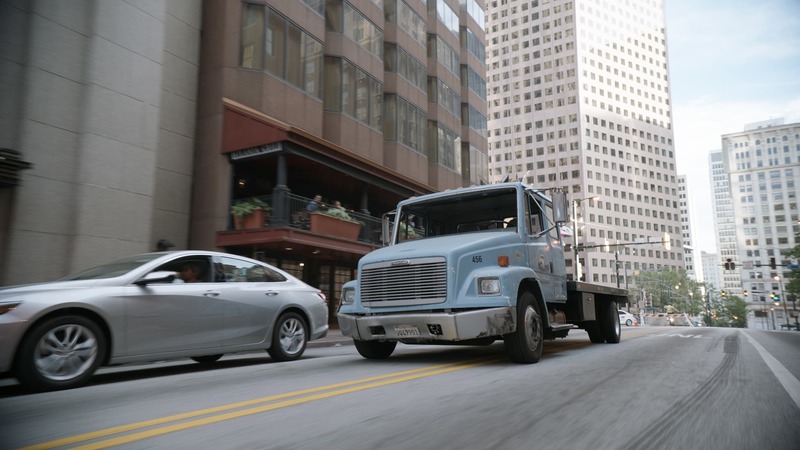 When Ant-Man uses it as a form of skateboard, the truck was fitted with a hydraulic system that allowed it to appear to lean over under the weight of the giant Ant-Man. DNEG then animated the giant Ant-Man to match the empty but lopsided truck. There was about a week of second unit shot in San Francisco, including aerial shots. Cleverly, many of the most complex resizing shots take place on flat sections of road, with just the environments indicating the hills of San Fran. The team decided to match the CG cars to live action cars. "We always tried to keep as much real as we could", Ongaro explains. He was on set for all of the second unit photography of the chase. "It is of course less work if we can do as much as we can with stunts and then do a digi-take over when needed". The team LIDARed the sets and photographed all the environments for reflections and to help with the tracking. 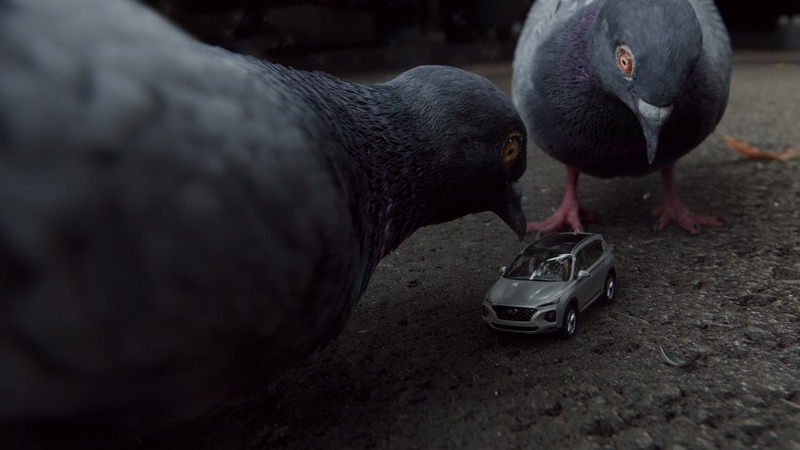 One practical blocking problem for the virtual cinematography is allowing the audience to keep track of the small cars or vans. It was important that the audience did not think the car had disappeared when it suddenly shrank to matchbox size. In a wide shot, a toy sized car could easily be lost. "We did have to cheat the size in a few shots, because if it was done at the actual size it was meant to be, the audience just wouldn't see it, so we had to cheat the size up a little bit". To help the audience register the tiny car, other objects such as leaves would sometimes need to be painted out of the plate photography so that such similar sized objects were not mistaken for the car by the audience. 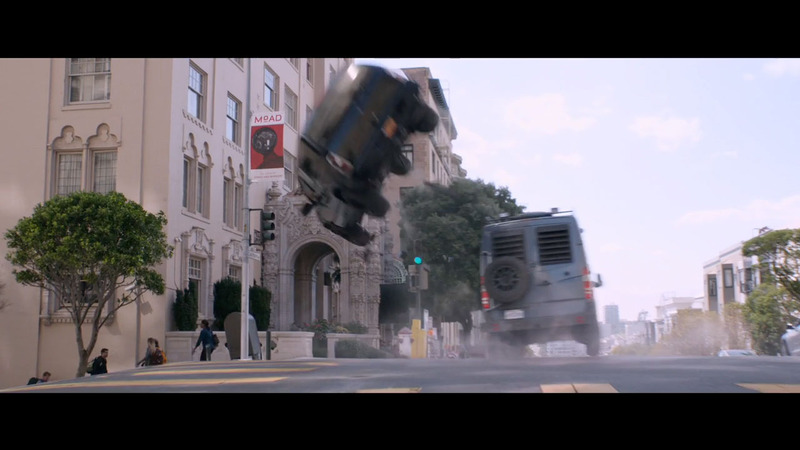 In the chase, Wasp and the Ghost are also jumping between vehicles. 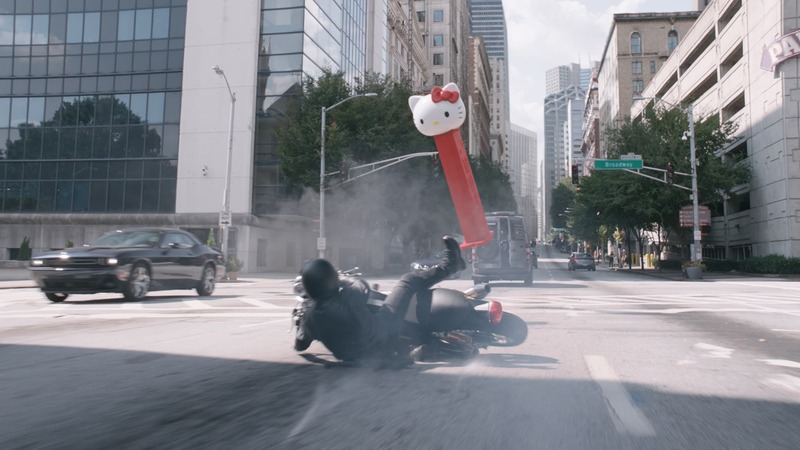 For most shots the team filmed actual stunt performers in suits, and then an actor's face was projected onto a CG head which was placed on a body tacked stunt performer in a costume. The exception was the rescaling, which were fully CG. 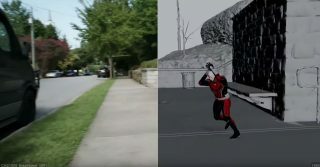 In nearly all the car chase shots, Ghost was a fully digital double. This was easier given her mask. It was important as her phasing required multiple poses and additional CG layers to be provided to the Nuke compositors. The de-aging flash backs in the film were done by Lola. The company is based in LA but has expanded to include New Orleans, London and New York and is now home to some 90 to 100 artist and producers. Janet van Dyne is played by Michelle Pfeiffer, and she, along with Laurence Fishburne as Dr. Bill Foster and Michael Douglas as Dr. Hank Pym, all got de-aged in the film. Lola once again did all this painstaking work, having previous done many other such effects for Marvel films including the original Ant-Man. Janet van Dyke was intended to be in the first film but did not appear. 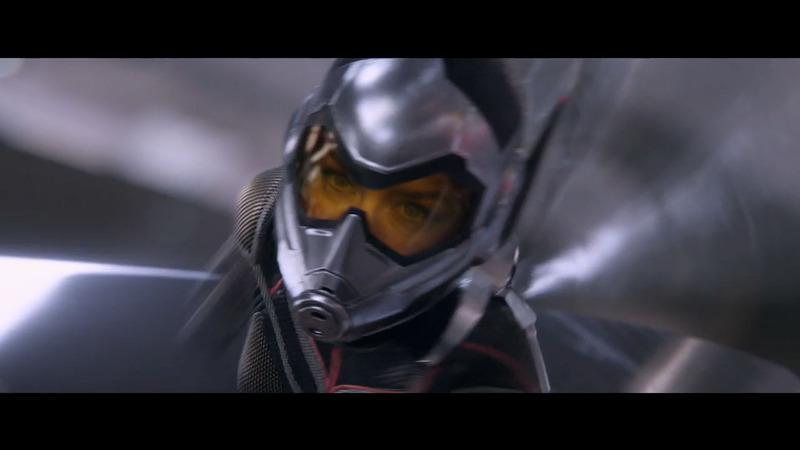 In this film we see her both as a mother and as the original Wasp. In this film, while the actor Michael Douglas had aged a couple of years since the first film in 2015, the de-aged version was once again from about the time, some 30 years ago, that Douglas filmed Wall Street. "He is going from 72 to 42 years old. So it was about a 30 year reduction" commented LolaVFX supervisor Trent Claus. "That puts him just a few years younger than what he was supposed to be in the first film, if I am doing my math correctly !" This time the wardrobe was different and the wig the actual actor wore was a little different but the general process that Lola used was the same. The Lola process is painstaking Flame compositing work. Only a few people in the world are fully skilled in the craft, although many have tried. The Lola process is a mixture of compositing approaches that remove wrinkles, adjust eyes, facial sag and feature size. As people age their noses and ears grow larger for example, their eyes and especially their eye lids are lower, and yet Lola prefers to not have any makeup on the actors and to not put any tracking marks on them. The team at Lola are invited to the preproduction discussions but as much as possible. "The Lola method is working directly on the actor and preserving their performance, - that is because we want the film makers to be able to do whatever they want. We don't want them to have to shoot something strange. We want them to be able to film whatever the story calls for" explains Claus. What made the opening family goodbye scene more complicated that it might first appear was both Douglas and Pfeiffer moving in and out of shadow as they moved up the hallway. "It always makes it much more complicated on our end, when matching that sort of lighting ...it really makes it 10 fold more complicated". Pfeiffer's de-aging was in a sense less complicated as she has aged incredibly well. In some ways, her de-aging was technically not dissimilar to the work the team did to de-age Kurt Russell in Guardians 2. Pfeiffer was technically similar, in the sense that she had a big smile and big hair. 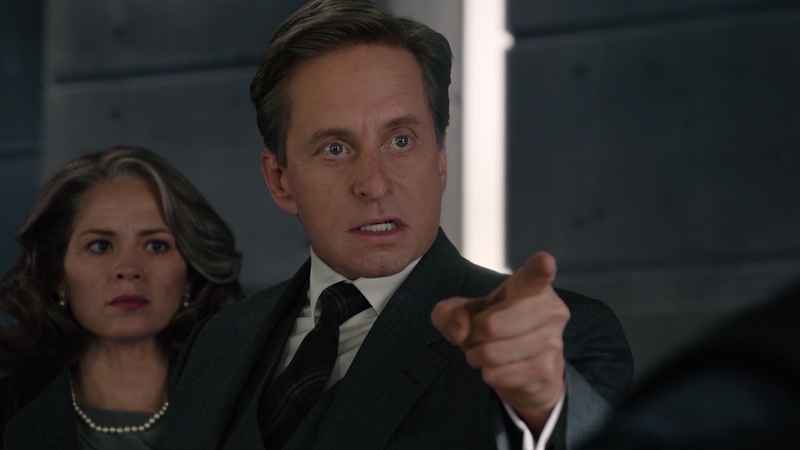 It was very unlike the sort of facial expressions that the angry Michael Douglas showed in the first Ant-Man film (where he slams someone). Pfeiffer's reference period was the actresses work around the time of Ladyhawke. 1985's Ladyhawke with Rutger Hauer and Michelle Pfeiffer. The Lola team also uses doubles and films them for reference. For Laurence Fishburne, the team hired his son as the younger double. 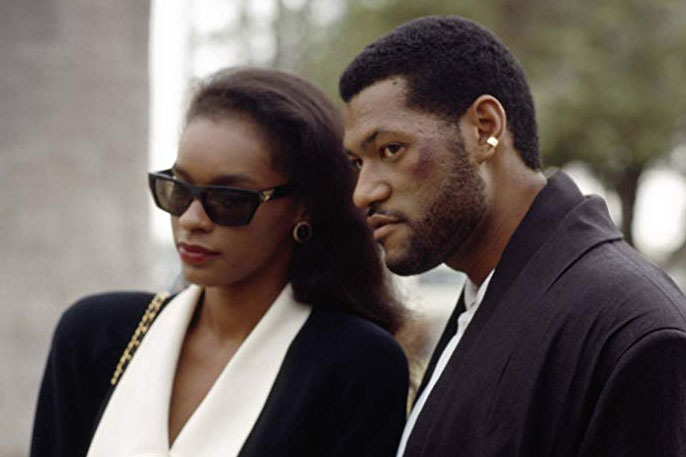 While it is entirely Laurence Fishburne in the final shots, his son informed the team as to how the actor's skin would of looked when younger in this particular lighting situation. The film period reference for Fishburne was his 1992's Deep Cover and 1991's Boyz N the Hood. All the actors always wear rigs, so that just their faces need to be de-aged. This is in line with Lola's approach of doing what they can to make the footage and the actor look as natural as possible. Laurence Fishburne In Deep Cover. Lola actually do more than just the faces of the actors, Fishburne is younger and thinner and all the actors posture is adjusted to make their standing positions more characteristic of a younger person. Technically, one of the most complex aspects to solving the facial de-aging with compositing in Flame is to avoid softening the image. Any image processing can soften an image as Claus and the Lola team know well. "Even if you're not doing anything, just a layer in (flame's) Action will make it a little softer. It is an eternal struggle. The skin texture and retention of that skin texture dictates our entire workflow" says Claus. "So all of the beauty tricks and things that, that are used commonly in commercials or even in a lot of films, we simply can't use. They just make everything way too soft and these particular kinds of de-aging shots get scrutinized to such a big degree. We have to be extra careful". Another issue is blood flow. While most people can not deliberately notice the subtle changes in a face with blood flow, the Lola team will never composite a still patch to remove a wrinkle or blemish, they always seek to composite a moving clip. This is particularly the case around the nose. "For example, the nostrils and the tip of the nose, the skin is really translucent there, so you can really see the effect, especially if they're angry and they're flaring their nostrils" he comments. "You can see the lighting changes, the translucency - and blood flow going on there. If we cant use a clip then we have to animate, by hand, to match, wha ever was originally happening." Eyes get special attention in terms of adjusting the saturation, the level of bloodshot, removing some of the washed out appearance of the iris and general discoloration, but the team always keep the actors original eyes, they never use CGI. As humans we see faces as identities and it is very hard to actually see the details of the face. To combat this Claus often reviews a shot upside down as well as normally, "to remove the subconscious sort of things that you're trying to fight against and actually see the face as an object". But even then the human brain has a way of normalizing whatever one sees on a face after time, If you have a family member with a birth mark, you will always see it but you soon fail to notice it. For this reason the team are often swapping work and getting fresh eyes on a shot to be able to articulate what subtle detail still needs adjusting. This level of compositing is a marathon not a sprint, and only certain artists have the temperament yet alone the talent to succeed. In an Interview with Slashfilm's Peter Sciretta, Marvel's Kevin Feige himself leaked that in the next Captain Marvel film, some characters will be de-aged for the entire film. And Coulson. So that’ll be the first one where it’s a character for the whole movie, as opposed to a glimpse at a certain period of time. It’s the whole movie. So it’s possible, assuming that works. It’s possible. It’s very good when you are starting by the way with somebody like Michelle Pfeiffer or Michael Douglas or for that matter Sam Jackson or Clark Gregg. All four of them,...You have all the reference material and they have aged amazingly." There is no official confirmation who will be doing this particular visual effects work, but after the award winning visuals LolaVFX has done for Marvel, - from 'Shiny Steve' in the original Captain America to this work in Ant-Man and the Wasp, - it would be shocking if Marvel did not use the brilliant team at LolaVFX. 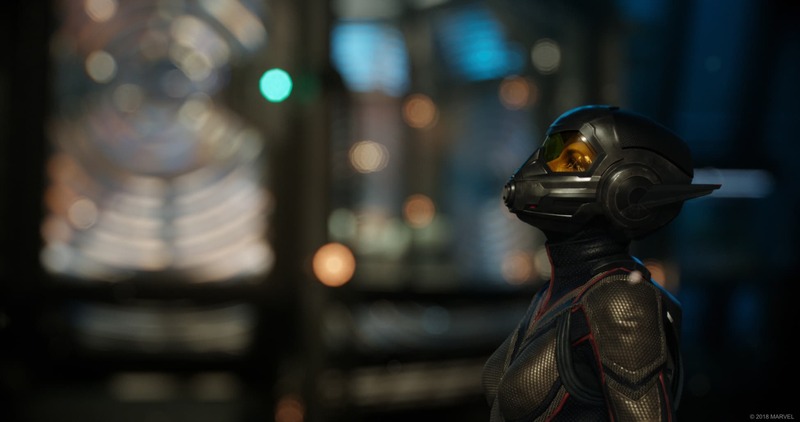 Following a successful collaboration on the 2015 film, Ant-Man, Luma continued to work with the Marvel filmmakers to bring the story on the new Ant-Man and the Wasp. Luma worked in both their the Los Angeles and Melbourne studios on the film. Luma handled several key sequences and character developments. 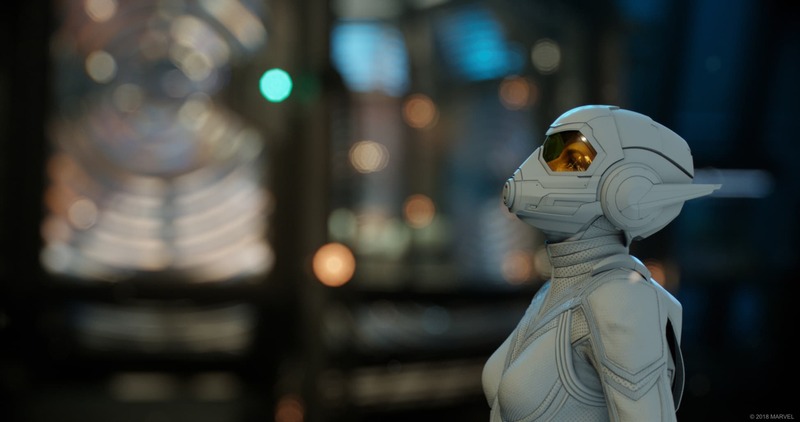 For example, Luma worked on the scenes where Ant-Man and The Wasp infiltrate Ghost’s hideout. The sequence begins as both Ant-Man and The Wasp shrink to travel through the microscopic holes in brick walls. Luma re-created the entire environment as CG. The team used blue screen, full CG replacements and 3-D face replacements to bring characters to life. The in-house Luma studio was also used to shoot mocap physicality sequences. For the quantum tunnel sequence, Luma digitally recreated the environment, focusing on complexity and detail that would make the tunnel dynamic. The look was designed from heavily treated 3D passes and plates, leaning heavily on their comp look development lead to create the look in step with the FX artists. Luma artists used a combination of effects to enhance key character moments in the film. While Ant-Man is hiding in the school, he suddenly has an issue with controlling his suit. 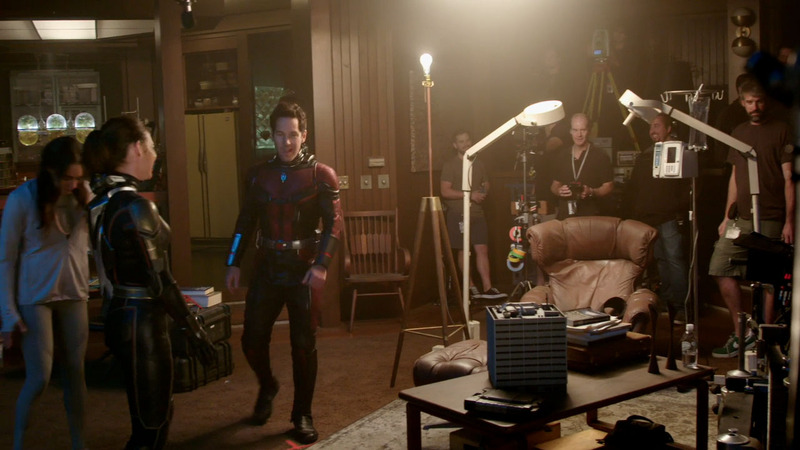 The idea behind the sequence was to use an old technique such as forced perspective, aided by modern technology, to achieve the visual gag of the giant-sized Ant-Man literally bursting at the seams of a small broom closet. To accomplish this, all the plates were designed to be shot independently and then assembled in the comp process. This sequence then dovetailed with the short Scott Lang escaping the school done by Method Studios (below). The pieces were individually tracked and match-moved while another camera was created to re-film the scene and compensate for the different field of views of each acquisition camera. Luma replaced pieces of Ant-Man’s body with a high-resolution full CG asset. The mix of photography and CG was key to tricking the eye and maintain all the subtle comedic performances. 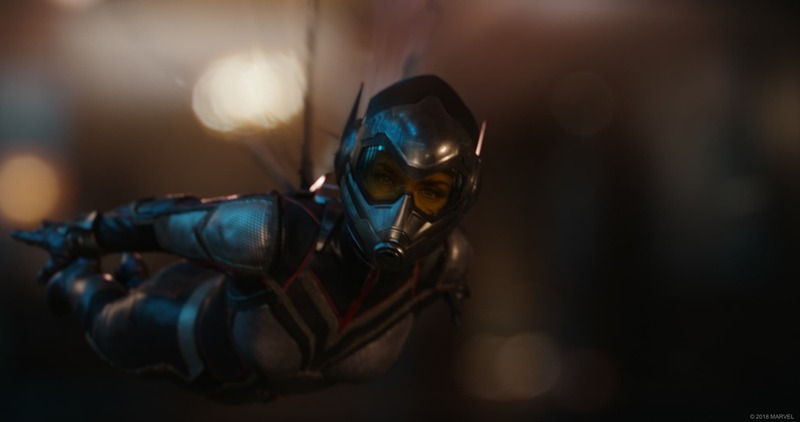 In Ant-Man and The Wasp, it was vital that the storyline and visuals continued from the first film. 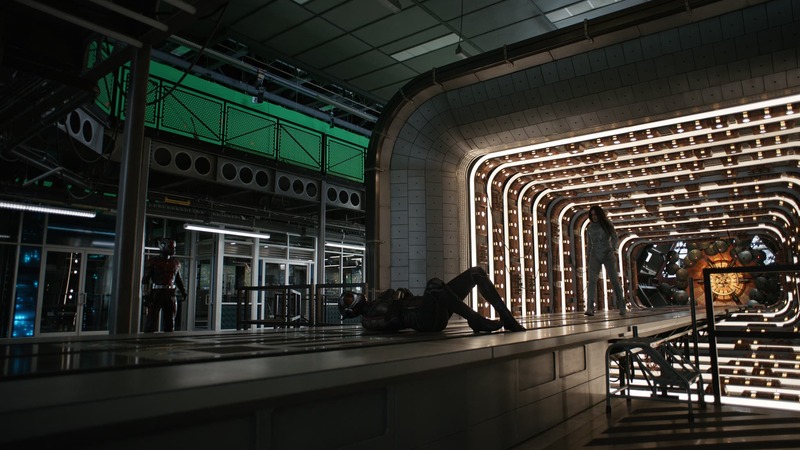 Special attention was paid to creating the missile launch, which had to be replicated exactly, to produce the look and feel of the shots from the original Ant-Man. Luma researched a Russian missile silo and began the build by first focusing on the minute details of the asset to achieve photorealism in extreme close-ups. Additionally, the artists developed volumetric for the launch plume, smoke trail, and cloud banks. The missile, Hank, and Janet assets from the original film were ingested to match the looks exactly, intercutting poses and identical actions across the edits. To tie it all together, Luma created a particle pass for the ice crystals and wispy volumetrics as they pass through the clouds. 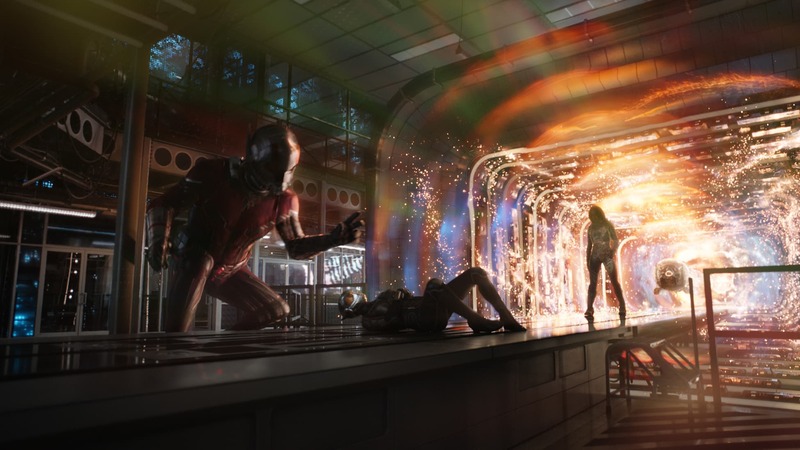 In Ant-Man and The Wasp we once again visit the Quantum Realm, a magical alternate dimension that was designed and created by Method Studios based on concepts from Marvel, and guidance from Director Peyton Reed and Production VFX Supervisor Stephane Ceretti. Method Studios produced this new view of the Realm. On set, the actors were filmed on a flat, dirt landscape, which Method transformed into an undulating surface through multi-layer simulations. 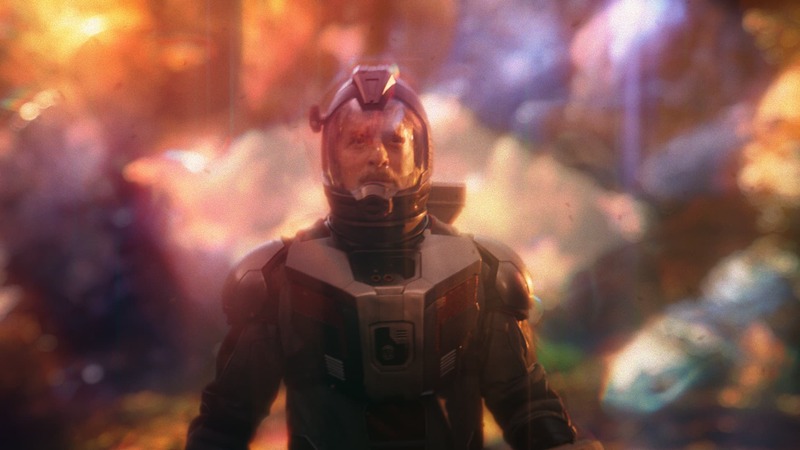 Outside the Quantum Realm sequence, Method also handled one of the film’s more comedic gags when Scott’s suit malfunctions and he’s stuck at the size of a preschooler. 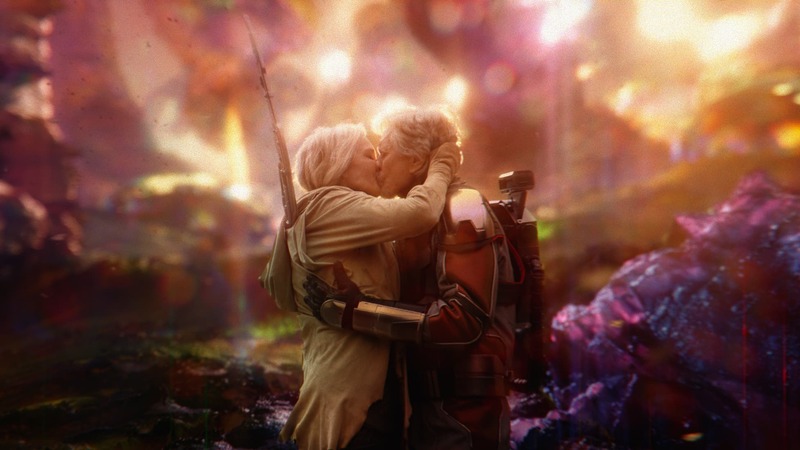 The scene was shot practically with a dual camera rig and married with mocap data of Rudd. Ceretti chose to shoot with greyscreen, rather than the traditional blue- or greenscreen, for scenes that would have CG enhancements. This approach allowed artists to more closely match the on set lighting.